And thus, on June 24th 1999, started the public life of the bot R�-D�. The original R�D� was first worked on in early June, 1999... in private rooms so that his development would be kept secret (and less annoying to friends in the room, bot testing is not pretty). His scripts were first generic bot scripts until PrincessLeia2 was able to write her own scripts. At one time during his development he had a slot machine, another part he was a game bot.. but by June 24, 1999, his official "release date" (and birthdate) he was in the form that many of use know and love today, but with the nick R�-D�. It wasn't until July 27 of 1999 that he finally was settled in with the nick R�D�, and later after a change of servers, he became just R2D2. He also had a "fool" script that got very annoying once people discovered it, much like all his scripts %) he would respond everytime someone said the word "fool"
R�D� was neglected for about a year, when PrincessLeia2 was mostly offline... but when she came back he had a few new scripts added. A working mp3 script was created, and he responded to the requests of almost everything a person wanted with an ! before it. And then came his most important use, a room moderator bot. He had always had !kick scripts that his friends could use, but we decided to make #13thHour +m (moderated, so that only people who had voice or ops could talk). And since we weren't always around we needed a way to continue to give voice to our friends even when we were not there, this is where R�D� came in, he had a friend list to voice friends when they came into the room. Although this was based simply on nickname, and obviously wasn't fool-proof (people who changed their nicks constantly would not be voiced with their new nicks... etc) it worked well. So now R�D� was a permanent and necessary part of #13thHour. X-Chat is a graphical chat client that runs on X in linux. And although it is a great program, it takes up more ram than most programs, and so isn't great for running 24/7, like R�D� needed to be. Plus, everytime x is shut down, or his machine was rebooted, he was down... definately not good for a busy machine. So he was moved first to text-xchat so he could run using little ram, and stay up when x wasn't. Still that was not a good solution. Now PrincessLeia2 and Time ran their chat clients from their webpage server, hardly ever had downtime, and since it was a box with a much faster connection it was preferable for connection, so R�D� would be up constantly, he was then converted to a Perl Irssi script. Doing all the same things as the X-Chat R�D�, he has turned out to be a very sucessful script, with much more dependability than previous versions. Originally written on a Pentium 3, 450 mhz computer he was moved more than a few times. Resided on a 133 mhz 586 for some time, as well as being in "storage" on a zip disk for a month or so. He then moved again to the Pentium 3, where he stayed most of his life. 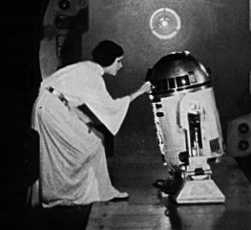 Then when PrincessLeia2 moved in with Time R�D� was moved to a 300 mhz K6, where he ran on windows 2000 for a few months. Once the X-Chat R�D� was completed he was moved back to the Pentium 3. And currently resides as an irssi bot on a Colbalt box that this webserver is on. Want a copy of one of the R2D2s? They arent much use for anyone but PrincessLeia2 and #13thHour... but if you are developing a bot in any of these platforms they could be of *some* use %) The zip files contain all the files referred to in the script.